The Mercer County Fair will host the exhibit, “Remembering Our Fallen” to remind Americans of the ultimate sacrifice made by those who died from wounds suffered in Iraq and Afghanistan. 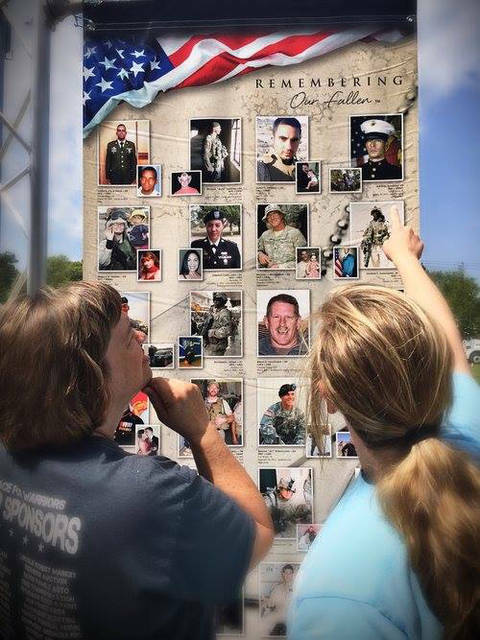 CELINA – An emotional exhibit, “Remembering Our Fallen” will be displayed at the Mercer County Fair, Aug. 10-16, to remind Americans of the ultimate sacrifice made by those who died from wounds suffered in Iraq and Afghanistan. The memorial includes 31 tribute towers with military and personal photos of almost 5,000 of the United States’ fallen since Sept. 11, 2001. This memorial was unveiled nationally at the steps of the Lincoln Memorial in Washington, D.C. on Sept. 7, 2017. Sponsors of the Tribute Towers are American Legion Post No. 345, Celina Eagle Riders, Coldwater Eagles, Fort Recovery American Legion, Fort Recovery V.F.W., Maria Stein Legion Post No. 571, Mercer County Veteran’s Office, St. Henry American Legion, St. Marys V.F.W. Post No. 9289 and the Mercer County Fair Board. National organizers continually ask for help in contacting Gold Star families to include every single American who has died since Sept. 11, 2001, in the War on Terror. There is no fee to families. Visit www.RememberingOurFallen.org and provide basic information and two photos of the fallen loved one. This national memorial also includes a tribute tower to recognize the service men and women who died from training accidents or attacks while stationed stateside or on our overseas bases. Those who return from war with the invisible wounds of post traumatic stress syndrome and succumb to suicide are included on a tribute tower to recognize the tragedy of PTS. For more information, visit the website www.RememberingOurFallen.org.